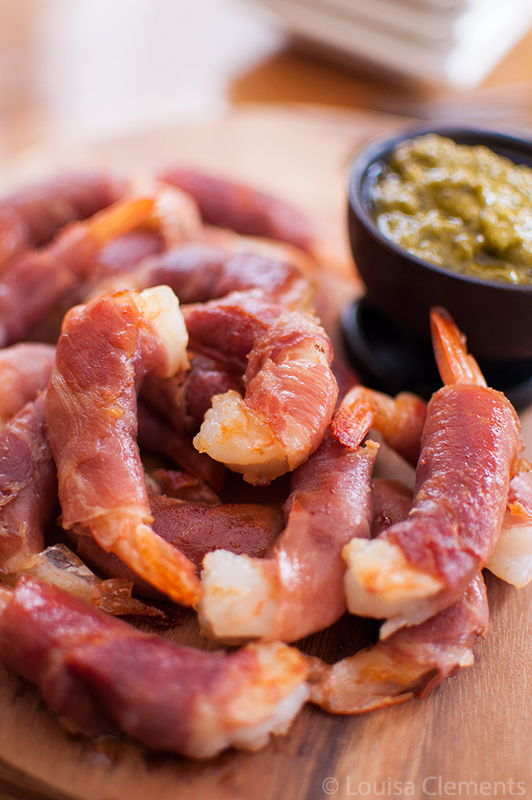 Prosciutto wrapped prawns are the perfect savoury bite for entertaining, this appetizer is served with pesto and comes together in minutes.
. 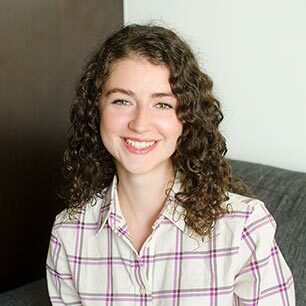 I would consider this to be required reading for any home cook who loves to host or is looking to gain more confidence in their hosting abilities. Jan and Julie provide over a hundred approachable recipes along with all sorts of tips for serving and decor which will having you feeling like you could host a dinner party every weekend! There are many things that I love about this book, but my favourite is the way the book is divided into different scenarios. 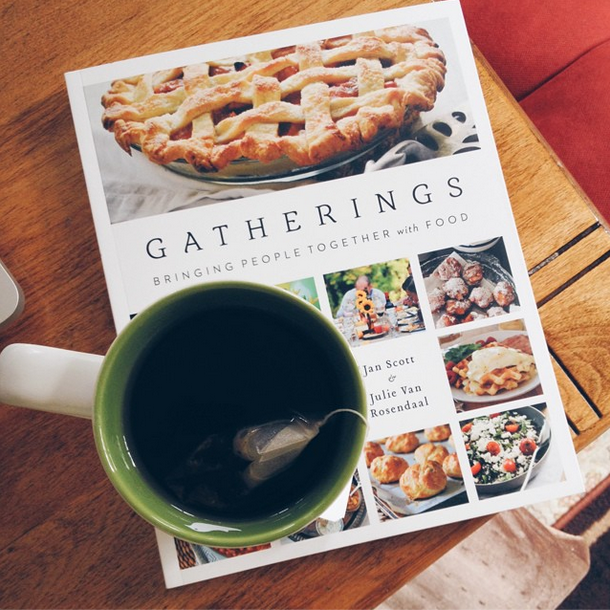 They cover everything from weeknight dinner to birthday parties to book clubs. Gathering around food doesn’t always have to be a momentous occasion, because as the ladies say in their book “We connect around the table like nowhere else”. Now that it’s December, a season full of gatherings, I wanted to try a simple appetizer from their “Cocktail Party” chapter. Over the years, I have developed some go-to, no-fail recipes for entertaining but where I like to change it up is with the appetizers. I always look for simple recipes that don’t require many ingredients or tons of prep. These prosciutto wrapped prawns fit the bill. And you can bet that they will be making an appearance at my annual Oscar Party this year. 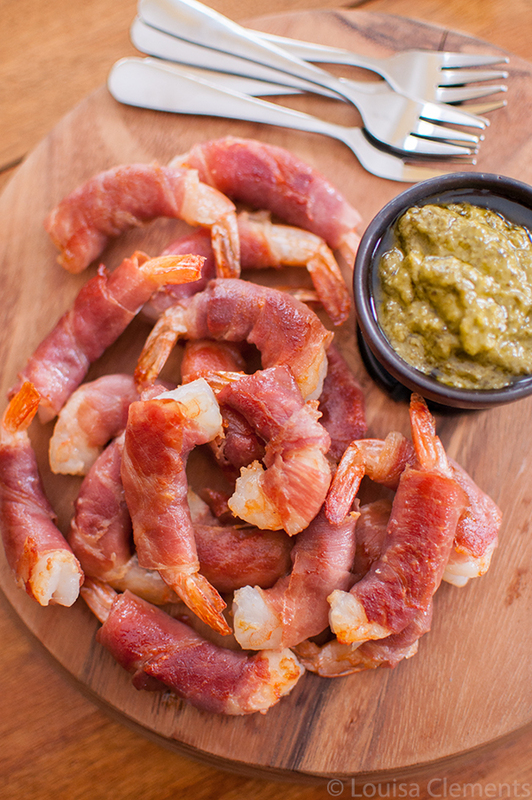 Wrap raw prawns in prosciutto. Heat olive oil over medium-high heat and cook prawns, flipping as needed until opaque and cooked through. I can’t recommend this book enough, and it’s the perfect Christmas gift for your friends or family who love to cook and gather around food. I think I’ll leave you with a favourite little quote from the book. Food is our common denominator-it brings people together to celebrate, to comfort, to nourish and entertain in every country in the world. Now, how fun is this – I’ve gotten together with a bunch of wonderful Canadian bloggers for a Gatherings blog tour – check out the posts below for more info on this great new book! Disclaimer: Whitecap provided me with a copy of Gatherings for review purposes. All opinions expressed are my own. This post contains affiliate links, thank you for supporting Living Lou! These look like they would be perfect for any sort of party - I kind of want one now, for breakfast! Thanks so much for bringing these to the virtual table for the book tour Lou! love this! Thanks so much for participating! Your shrimp look gorgeous! Thanks Julie! :) The book is stunning. Thank you, Valerie! Asparagus wrapped in prosciutto is one of my favourites too! Looks great! This is the perfect kind of salty appetizer to serve at any party. Thank you, it's definitely a crowd pleasing appetizer! Great choice Lou! They look fabulous! I love how simple this recipe is. And so enticing! You can bring them to my place anytime! I can't wait for us to Gather in the new year! I think this will be perfect for my friend's super bowl party this Sunday! Thanks Lou for the idea!